This Easter we thought the best way to decide which lawns were best for backyard fun, was to ask the experts. 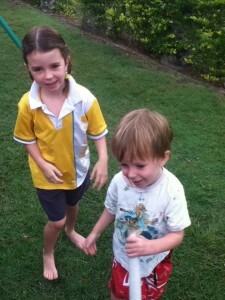 And who are better experts on backyard fun, like Easter Egg Hunts, than kids. I know our friends and families kids where very keen to help us out. 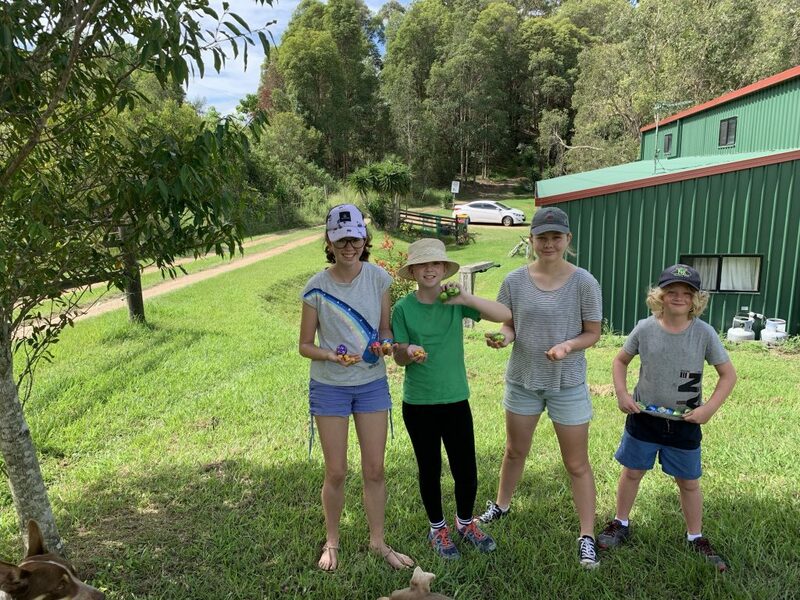 Our First group of Easter Egg Hunter experts decided that a thin leafed lawn was the best for Egg hunting, and the occasional fall while rushing to secure your chocolate goodness. See their movie here. We then invited a larger group of boys and girls to come onto the farm and let us know which thin leafed lawn was their choice for their home. Check out our second team of experts here. A huge thank you to these experts who made my weekend full of smiles, and the occasional melted Chocolate. I was hoping that they wouldn’t find them all, but alas, there were no left overs on the farm. If you have your own little team of experts at your home, who know what will make their back yard a place they all want to go out onto everyday, then bring them out to the farm to help you choose your best new lawn. Get in Contact with us to arrange your visit. Unfortunately our experts ate all the Chocolate though. Have a great Easter break everyone. From all the Team at Coastal Turf! One of the joys that we have as a farm and a small family business, is when our customers send us pictures of the turf they have installed. The little blades of grass start off as little “babies” in our paddocks and then slowly grow into thick lush harvestable turf. Then from being a strong healthy turf slab, sitting on a pallet, the last I see of our prodigies, is usually on the back of a truck, heading out to become someones lawn. Our drivers, lucky men, get to see the exciting beautiful places that our little paddock babies get to become beautiful lawns. But on special occasions, from special wonderful people, we receive beautiful pictures off the amazing work people do. And one of my favourites is B3nnett Property Group. Marty is a great guy to chat with, and one of the few people I know who can work side by side with his wife. So much respect to them both! 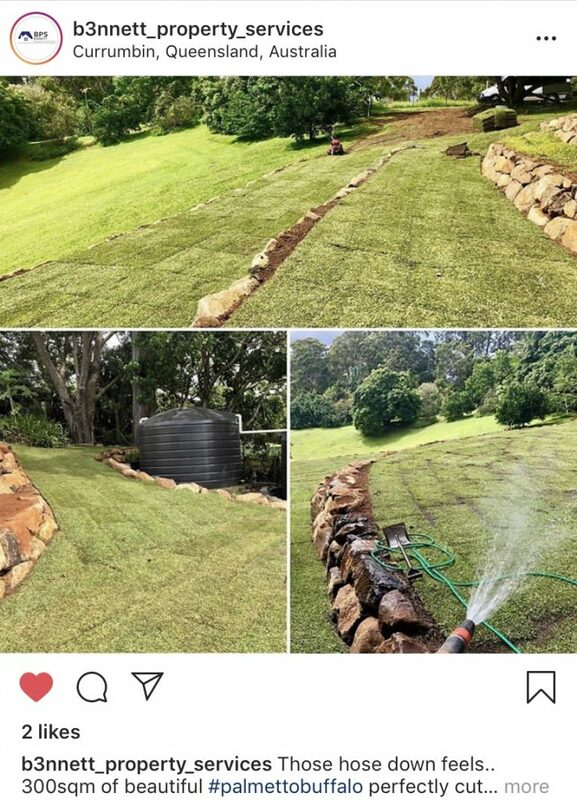 And this is the beautiful installation of our Beautiful baby Palmetto at Currumbin, to become someones brand new beautiful lawn. I can’t wait to see it grow and mature into a beautiful lawn. If you want to see more gorgeous lawn pics, head over to Instagram and follow us! So when we send out our baby turf slabs to grow and mature into your beautiful new lawn, please do not be shy in sending us baby pictures. We love baby pictures! Or post them to our Facebook page and we will bring you a Fertiliser pack as a thank you! The best way to ensure that your Lawn stays green is to give it the best start in life. By purchasing a Coastal Turf Lawn you are already off to a Green Start. 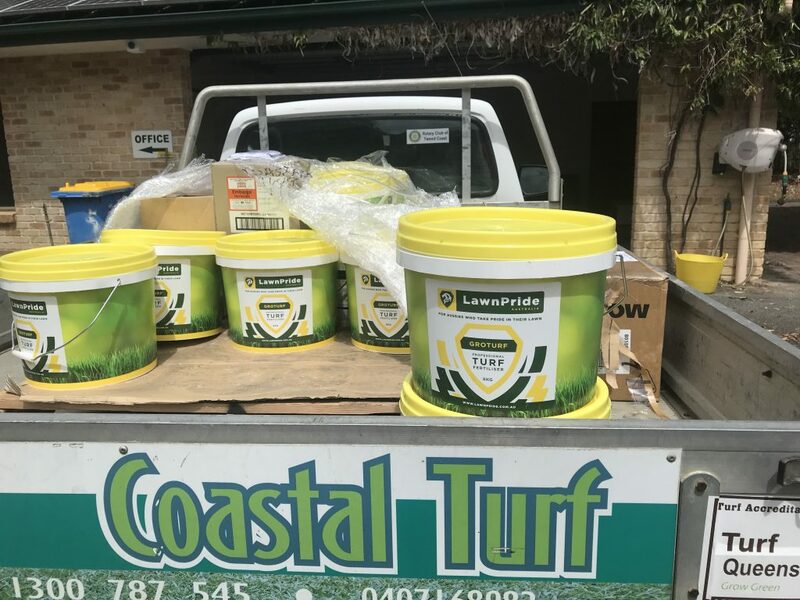 Your Coastal Turf lawn will come fertilised, green and fluffy. It will have had all the love and care that a man can give a paddock to create a beautiful lawn. When you install your new lawn, we recommend that you spread a lovely layer of fertiliser under your turf. This way when the little baby fine rots come out of the slab, looking to establish them selves into your new lawn, they hot a big delicious feed! Coastal Turf’s Lawnpride Underturf starter will give your lawn the best possible start. It has all the nutrients to aide in quick establishment, as well as the added bonus of water crystals in the perfect quantities, to ensure that your lawn is green and beautiful. Ask us about this product when you order your new CoastaL Turf Lawn. 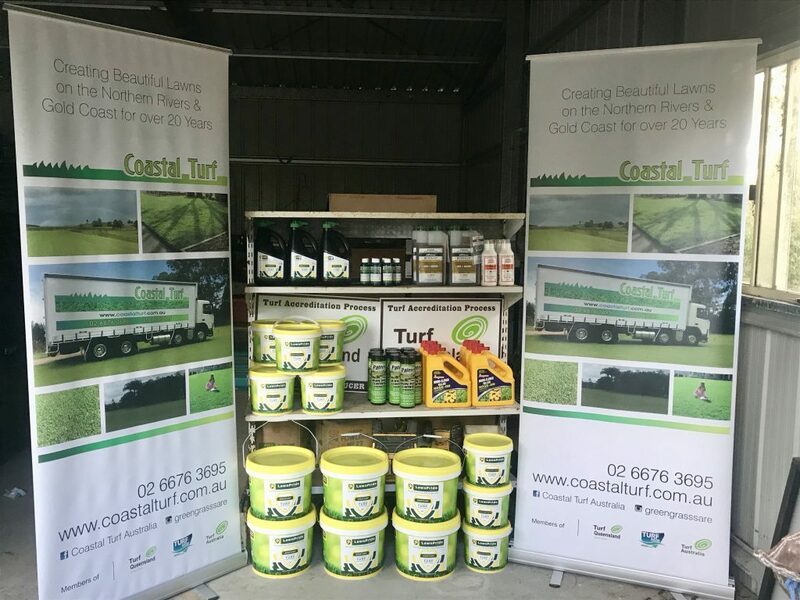 Then is you want to ensure the continued long term health of your lawn, Coastal Turf has specially formulated products for our Coastal regions to promote the growth and colour of your lawn. As well as protect it from Lawn Grubs and evil invading weeds! Our team of actual real Horticulturists, and Lawnotics (people who love their lawns) will help you to choose the correct product for your lawn. And bring it straight to your door on the Gold Coast, Tweed Shire and Byron regions. And in March you get the added bonus of a Coastal Turf team member having a quick chat about your lawn onsite as well. So get in contact with us today to organise your delivery. Is a delivery on its way to you? Often it can become so overwhelming when you choose the right varieties to become your new lawn. So at Coastal Turf we want to take the guess work out of one of your Life Choices. Your Lawn Life Choice. Your Lawn Life Choice is probably not as dramatic as a lot of your other life choices, like Partner, Career or child’s name, but it is one, that made properly can created a smile on your ace every morning. The different leaf sizes effect the way your lawn will preform. A thicker leafed lawn will generally perform better in the shade. A thinner leaf lawn will thrive in the heat and sun! Not only shade and sun will effect your lawn, but also soil type and proximity to the Ocean. At Coastal Turf we have listen to where your new lawn will be, how it will be used, so we can match the best grass type to your lawn. In our busy days, often you won’t have time to get down to the farm to check out the different grasses, or have time to get to one of our display yards. Knowing this, we have developed a program where we can match grasses to your new lawn and then send you photos of the leaf and what the lawn would look like straight to your phone. So get in contact with us today and we will assist you in your Lawn Life Choice. How easy is it to install a new lawn? How easy is it? Well it won’t take 1 minute like it does in this video, but it is like putting a jigsaw puzzle together. You start on the outside and work your way in. But unlike a jigsaw puzzle, you water your turf puzzle as you go. This helps cool the turf as you place it down. And aides you in not having to water heavily when you finished. Also if you are the waterer (as I was) then you get a break from the actual laying as well. The installation process is also aided in the Coastal Turf Installation and after care guide we provide you with. As well as life long assistance if you ever need something to do with your lawn. The Office lady is Me! I’ve been in the office now full time for the last 6 months and off the farm mostly. And I do miss it. So opportunities like this one, I never miss. I love it. Chat soon, or watch out for me Installing turf somewhere! Its always a good day when I get get some dirt under my fingernails. The best Valentines gifts are personal and life long. One of those gifts that your loved one will see every day, make their heart skip a couple of beats and cause a knowing smile to spread across their face. Something that reminds them of you, and the love you share. You have a house together and that is a commitment. A pledge that you will work together to create a better life for you both. Now this Valentines Day, with a new lawn, you are saying to your loved one, I want to create a Home together, not just a house. Your new lawn will be the place you spend more time than you realise on. The place you sit and have a beer at the end of the day together. The place your kids will run around and play on. The area where you will jump, run and play with your family. So what better present can you give your loved one that a brand new beautiful lawn? They will see the lawn every day, on their way in and out of your home. They will feel the love when they walk out to the mail box, or clothes line. Or go outside with the kids. Or open the door for the cat or dog to come inside. I have always found its when you are doing the most mundane things, like hanging out the washing, that something catches your eye, and brings back a memory of the person you love and a huge smile breaks out across your face. Make the reason your loved one smiles each morning and afternoon you. and make your lawn that reminder. Your lawn is the last place you see as you leave your home, a huge reminder to your loved one how much you love them. And be on their minds all day. And when they come home, it will be the first part of your home they will see. Your love one can walk inside with a smile in their face. I have always found its when you are doing the most mundane things, like hanging out the washing, that something catches your eye, and brings back a memory of the person you love and a huge smile breaks out across your face. So make your lawn, the first and last place you see as you leave your home, a huge reminder to your loved one how much you love them. And be on their minds all day. Create a large display of your love. We can even create your display of love while you are away, and have the gift be surprise. Get in contact with us now to organise your Big Display of Love. Artificial or the way that Mother Nature intended it? After attending a conference, a friend gave me a brochure for artificial grass to have a look at how glossy and bright coloured it was. As we sat down to have a look through them, we were shocked to read all the DONTS in the leaflet for artificial turf. So we thought we would do a bit of compare…. Please wear what ever shoes you want to on the Real mother nature grass. Feel the softness under your bare feet in fact. It’s all natural and all wonderful. High heels will, in fact, aerate your lawn, and football boots tufts will repairs themselves quickly. Even when your little love takes a shovel to the lawn, it will repair itself. Please do drive on your lawn. In fact we drive tractors all over the paddocks before they become your lawn. And people will always want to park their cars on your beautiful Coastal Turf Mother Natures lawn. You know your lawn can take it. Your Coastal Turf Mother Natures lawn is looking after you. Long term pressure? Please your Coastal Turf Mother Natures lawn has been converting all the carbons and pollutants in the air into clean fresh oxygen for you. Even those created by the plastic carpet. How much more pressure can it be put under? Oh you mean the type like having a car on it. No problems. Or a trampoline? Easy; and the kids can walk over to it in whatever shoes they want to! Or None! No matter how hot the weather is your Coastal Turf Mother Natures lawn will always be cool enough for bare feet. 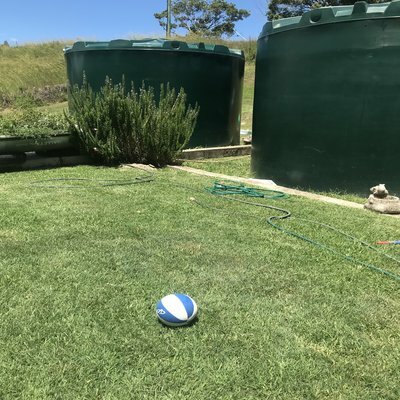 Why not have a game of bare feet backyard football or cricket while your out there. Or put on the sprinkler for a little while and listen to those giggles come out of your kids mouths. It really makes your day. Please do throw balls, and heavy things around on your lawn. And your school oval! Your Coastal Turf Mother Natures lawn will literally bounce back! Well, Its not really a good idea to put oil or any pollutants purposefully on your lawn. But rest assured if you do it will absorb it and move the yuck away from you. Your Natural lawn will look after you. I love sparklers. Its the closest we will get to fireworks in New South Wales backyards for a while. And it is absolutely a better idea to drop it on your Coastal Turf Mother Natures lawn, than it is on your tiles or wooden deck where it will burn a pattern in. But your lawn will take it all in its stride. The soft green lawn will provide a safe place for your kids to enjoy the sparklers, without fear of harm, to them, or your lawn. Eat your chewing gum, and whatever else you want to eat on your natural healthy green love lawn. 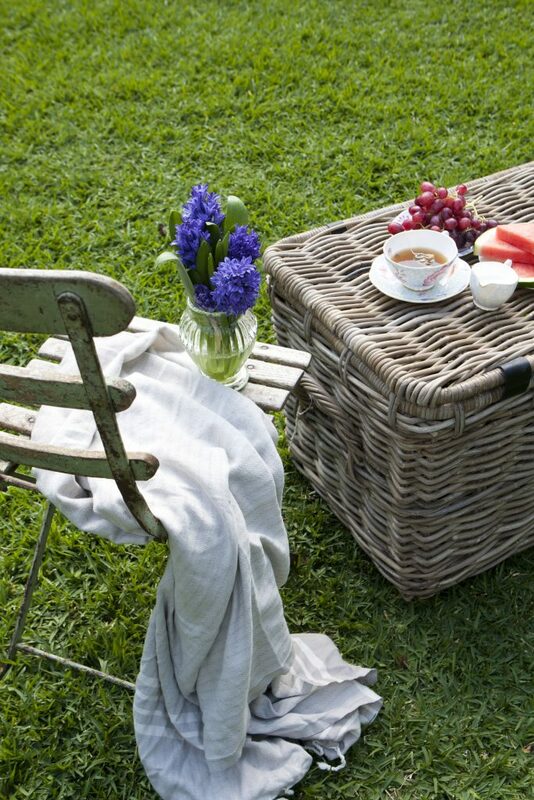 You will only stay alive if you eat, and picnics on Mother Natures Best are always amazing. Natural grass lawns will be comforting and cool when you sit down on them. And the truely best part, is that if you spill some food on the grass, no need to worry about clean up, the lawn will absorb the mess. And the good insects in your lawn will clean up anything else. I cannot guarantee that if someone drops chewing gum on your lawn, you may walk on it and get it caught on your shoes, it won’t be yuck. But you won’t have to rip up and replace your whole artificial plastic carpet lawn because someone dropped a bit of chewing gum. ALL drinks, be they sugary, alcoholic, milk, coffee, tea based are best consumed while sitting relaxing on your lawn. Get out your deck chair, spread it across your Coastal Turf Mother Natures lawn and enjoy. And if you happen to get some large arm movements happening, or your kids run and bump your glass over, it doesn’t matter. Your lawn loves you enough to clean up the mess. It will quickly absorb the liquid and the only fuss you will have will be having to pour yourself another. Wow! This is like something that I don’t think that anyone should have. But I guess if you do have a chemical spill at your place, after you call the EPA, they will recommend that you place soil over it and then place natural turf across the top. Who are we to argue with the EPA? Sports artificial turf should keep filling the quartz sand smoothly and water regularly, ensuring the trajectory and bounce of the ball. So even when you pay so much more for the plastic carpet, than you ever will for natural turf grass, you still have to top dress the area, and still water it so the ball runs smoothly? Even though it is not real, you have to waste our precious resources on a plastic petro-chemical based carpet? To me that is horrible. On your Coastal Turf Mother Natures lawn, your beautiful natural healthy, life giving lawn, when you water, you are helping yourself. Your lawn will give you fresh air. Not headaches from the petrol chemical smells. It will give you a cooler home, not a carpet outside that is too hot to walk on with bare feet. And when you top dress your lawn with a sandy loam, it will put so much nutrients back into the soil, which again will ensure that your Coastal Turf Mother Natures lawn can cool your home, give you fresh air, and the green lush lawn will make you smile. A natural green lawn will also help your mental health. Research says that a natural green lawn area will actually make you feel HAPPIER! So, after careful, probably biased, consideration; I really do believe that a natural lawn is the best for any home! At Coastal Turf we pride ourselves on making sure we can match the correct turf to your lawn. If you want to match the lawn you already have, then we will come to your place and help you match your grasses. Or if you have a new build, we will help you choose the right variety for your lawn. Like a shade sandy area, require a Palmetto Buffalo lawn. A full sun area that is going to have lots of Pitter Padder of feet, be they two legged or four legged, needs a totally different lawn. Like a beautiful Blue couch lawn; so soft for little bare feet to run around on. Or a Wintergreen Couch for the rough and tumble of dogs, and backyard sports. Or if you are on a budget, we make sure we can fit the best grass to your financial means. So give send us a quick email, and cool your home, breath your fresh air, spill your drinks, and play all day long on your lawn with a smile on your face. Back to School, Back to normal? Todays the day. The day my “free” labourers leave*. My kids are going back to school. Away from the heat and humidity of working on the farm during the day, and back to the air conditioning rooms of school. I love the school holidays. 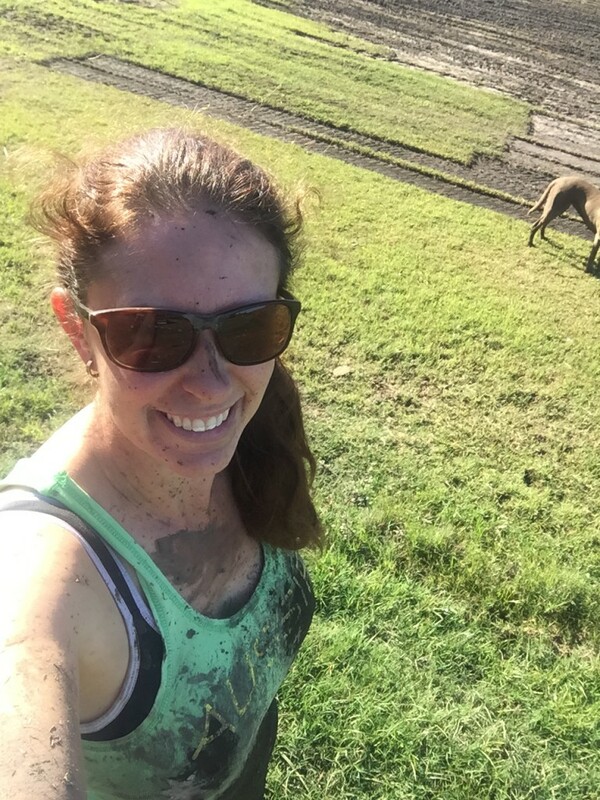 It means I get to spend some quality and not so quality time with my kids on the farm for me and at new lawn installations with their father. And, I know, it helps them to know why we come home so dirty and tired at night. It also gives us time to chat about all the different happenings in their lives. I learn so much about my daughters friends over the last 6 weeks. I now know more about Rugby League and Rugby Union and the differences that I ever did before. And why a Playstation is much better than a Xbox. I must admit that this one I am still a bit blurry on. And my kids know the difference between a couch and a buffalo. They understand the need to always have good manners, and they had lots of practice over the school holidays talking to customers. They also learnt how important it is to make sure that all the hoses are attached when you start the irrigation if you don’t want to get really really wet with Dam water. That is one of the beauties of Coastal Turf. We are a family farm. A family business, and we do not try and hide this. We celebrate it. 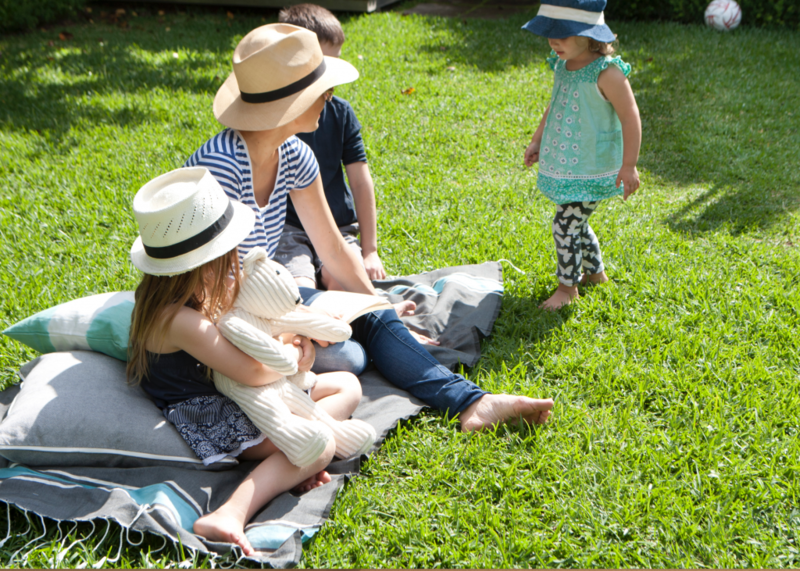 So when you purchase your new lawn from us you know that not only are you purchasing a quality green lush lawn, you are also helping us support our children. Which is why we always thank you for your order. Because you helping us to educate our children, by sending them to the local High School and also teaching them the ways of the world. Manners. Customer Service. Making eye contact. 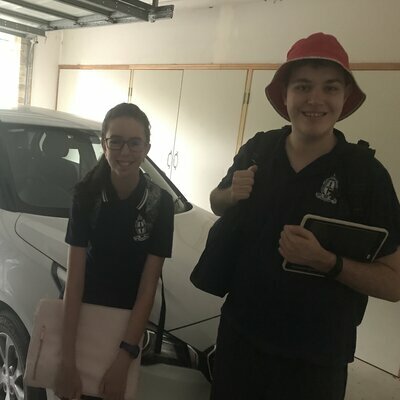 This is my two oldest on their first day at High School together. Year 7 and year 11. They made me take the photo at home. Just a side note. My kids always get paid. My youngest (he is 10) is a great gofer. A Go for this tool, go for that tool, helper. And he wants to get paid in KFC. Easy. And my eldest, at 16, loves WIFI, and playstation time. I mean how many people do you know that love Grass? And not the Hippie Grass, but the Good Old Fashion Lawn. The greenery that encompasses our homes. The soft living carpet that comforts our feet. The safety crash mat that not only cushions our children when they fall, but absorbs all their bodily messes. The air purifier that encourages us to take that big breath first thing in the morning. Well we do! And that is why we love cultivating our turf paddocks to become your new Lawn. Because we know how important it is to your every day life. 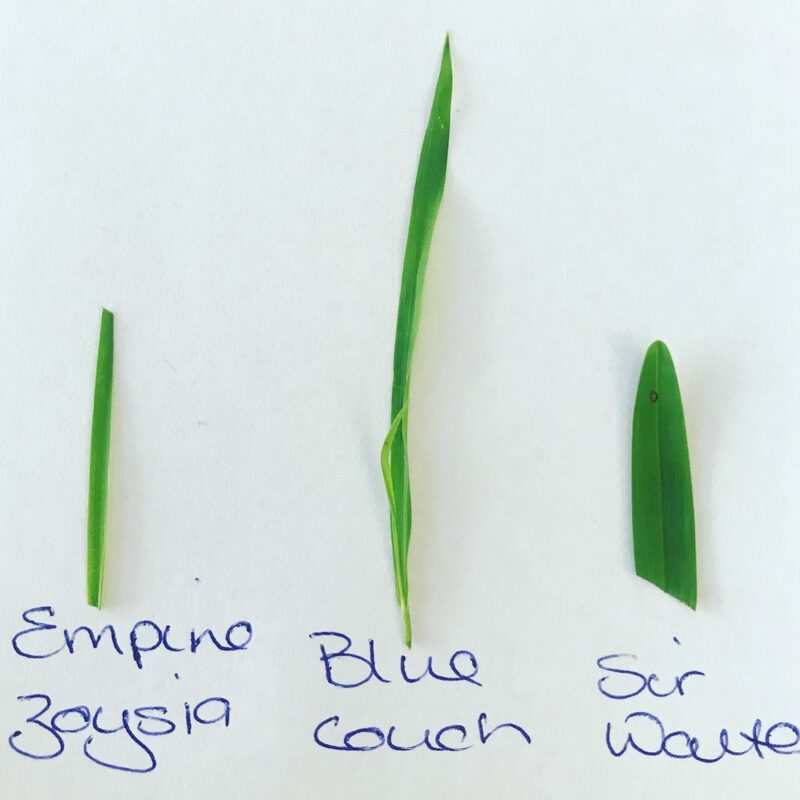 Even if you have an Odd shape, Coastal Turf can provide you with easy to use measuring tips to work out how much turf you require. And we are ready to help turn your piece of dirt, into a magnificent lawn. We offer you advice on the varieties as well as a DIY guide to a new lawn installation and Aftercare to ensure your new turf grows into your new lawn. And if you would like take the easier option, rather than convincing your Friends and Family to come to a Turf Laying Party, we can put you in touch with the best Qualified Installers near you. I mean who doesn’t love waking up in the morning and seeing brown sad dirt, But sitting down in the evening for a well earning Beer or glass of Wine with your toes being caressed but gorgeous soft Green Lawn. So let’s celebrate 2019 together. Get in contact with us to arrange your piece of Greenery at your place.